Routine eye exams Hot Springs, AR can help patients maintain healthy eyes and clear vision. At Holt Eye Clinic, we encourage all of our patients to come in at least once annually for a routine eye exam. We check our patient’s eyes for diseases, refractive error, and proper functionality. By visiting your eye doctor on a regular basis, you can avoid serious eye problems. Very young children who come in for yearly eye exams may have a hard time sitting still for examinations, or may not be able to follow directions from the eye doctor. For very young patients, eye exams are often performed one-on-one with the patient and eye doctor, without the equipment used for older patients. Patients are encouraged to see the eye doctor at least once annually, even if they have had no diagnosis and do not wear corrective lenses. Patients who detect symptoms of eye trouble, like blurry vision, eye discomfort and redness in the eye, should see the eye doctor even if it has not yet been a year since the last visit. Eye exams can take around half an hour to complete. These routine examinations do not hurt but may involve tests that dilate the pupils, shine bright lights in the eye and administer a gentle puff of air on the surface of the eye. Vision clarity - During the eye exam, the eye doctor will check the patient for refractive error. If a refractive error is detected, the eye doctor will write the patient a prescription for corrective lenses of the appropriate strength. Corrective lenses may include eyeglasses or contact lenses. Eye disease - Eye diseases like glaucoma and macular degeneration may have few or no symptoms before eye loss occurs. The only way to detect these eye diseases is to see the eye doctor on a regular basis. If eye disease is diagnosed, the eye doctor will make recommendations for treatment. Eye functionality - Comprehensive eye exams also involve checking the eyes for proper functionality. For example, the eye doctor may check the patient for the ability to track moving objects, perceive depth and see color. 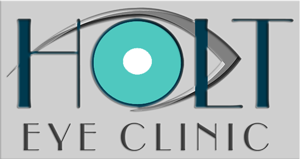 As your eye doctor in Hot Springs, AR, the professionals at Holt Eye Clinic can help ensure that your eyes are healthy. To make an appointment, contact us today at 501-624-0609.